Former Nissan chairman Carlos Ghosn could be in jail for another six months, his lawyer says. 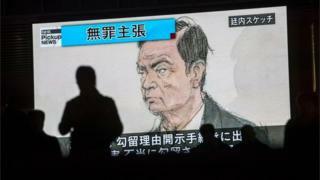 On Tuesday, Mr Ghosn appeared in court for the first time since his shock arrest in Japan in November last year. Accused of financial misconduct, he told the court he had been "wrongly accused and unfairly detained". Mr Ghosn, 64, was once hailed as the man who saved Nissan. He was led into court in handcuffs with a rope around his waist. Mr Ghosn, a towering figure of the car industry, also looked visibly thinner. So far, Mr Ghosn has been arrested three times. His current detention period ends on 11 January. Asked whether his client could expect to be bailed at the end of this detention period, his lawyer, Motonari Otsuru, said: "In general, in such cases in Japan, it is usually not approved before the first trial takes place." He then said that it could be six months before that first trial was held. His initial arrest shocked the industry and his lengthy detention has drawn some criticism. But a judge said incarcerating Mr Ghosn was justified to prevent possible evidence-tampering and the risk that he might flee. Mr Ghosn, who was hailed as the man who saved Nissan by building alliance with Renault, has been accused of "significant acts of misconduct", including under-reporting his pay package and personal use of company assets. The 64-year-old executive is accused of moving personal investment losses worth 1.85bn yen (£13.3m; $17m) racked up on foreign exchange dealings to Nissan. Mr Ghosn says he did ask the company to take on collateral temporarily for his foreign exchange contracts, but that it did not lose any money through this move. He said if he had not been able to do this, he would have had to resign and use his retirement allowance as collateral instead. If found guilty of the financial misconduct charges, Mr Ghosn faces up to 10 years in prison as well as a fine of up to 700m yen ($6.4m; £5m), according to Japanese regulators. He told the Tokyo District court: "I have been wrongly accused and unfairly detained, based on meritless and unsubstantiated accusations." Mr Ghosn said he had "never been accused of any wrongdoing" and had dedicated two decades to "reviving Nissan". The 64-year-old said he never received any compensation from Nissan that was not disclosed. He was first arrested on 19 November for understating his pay and rearrested twice in December. His most recent arrest involved fresh allegations of breach of trust.